It's been a couple days of hand applique here at Casa Stroud. I've been attempting to catch up on the pink blocks for A Green Thumb for Everyone. Two were totally done, and I've finished three. I've started the sixth block, and the seventh is cut. Just for fun, I've been pinning the completed blocks to the purple top. The setting fabrics do not make the pink version shine! There's time for that later! I did rip out the sweater (again) and have rewound the yarn into yet another center pull ball. On the plus side, I started a cowl and have it almost half done. I think I needed a bit of instant gratification! P.S. Jay, that's wonderful news! See you next week! P.P.S. 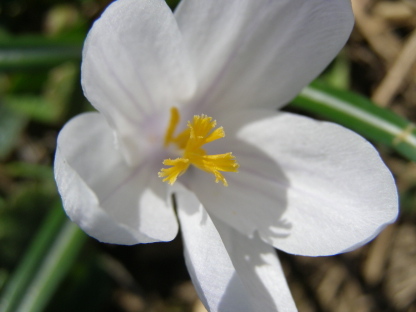 A quick shout out to Sylvia--how are you? Family good? I miss seeing you. 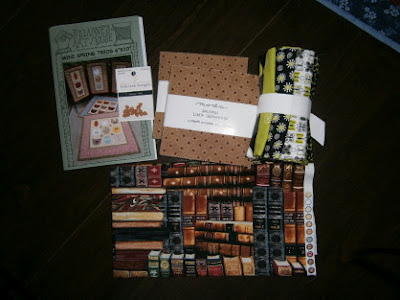 Last Saturday I bought an unusual array of quilty things: Two Moda Charm Packs, a piece of "book" fabric to finish a small wallhanging, a roll of 6 fat quarters in black, white and lime, tiny heart buttons, and a pattern to make tiny chickens (hens). I'll show you progress on any and all of these projects as it happens! Then, there was a padded envelope in my mailbox earlier this week! My friend Yochi, from Israel, sent me this lovely cross stitch pillow cover! She suggested using this as the center of a larger quilt. Here's a close-up of the workmanship and the lovely keychain she also sent. 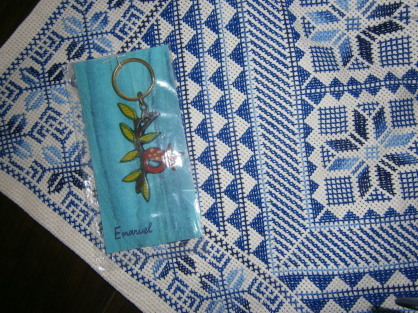 The keychain is from the Masada Museum, which is right above the Dead Sea. Have I mentioned recently how lucky I am? Thank you, Yochi! I love both items. Today was a bit of everything: outside raking and trimming trees, inside finishing an applique block, and various other things. Remember the gray/purple sweater that I showed you and then I ripped it out? Well, I started it again, and last night, as I was almost once again up to separating for the sleeves, I found the same error again! But I did discover what happened--there is a different colored marker at the beginning of the round. On all the other markers you increase before and after the marker. Well, my attention must have wandered because I increased both sides of the wrong marker. So I think it will have to be ripped again. I think I will move on to another project for a while. Maybe I need to start with a new skein--maybe this one is jinxed! Maybe the fourth time will be the charm! P.S. I am listening to Firefly Lane by Kristin Hannah. I Finished a New Quilt Top!!! About a week later than I had anticipated, but.... 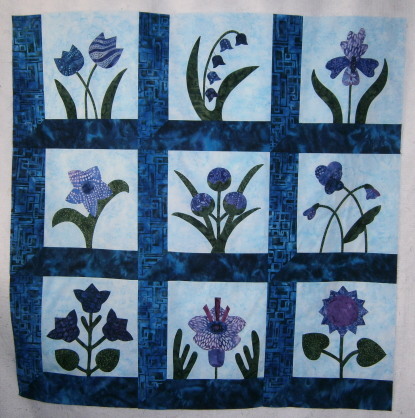 This is the purple version of my A Green Thumb for Everyone block of the month. All needleturn applique, with an attic windows set. This is very sedate compared to my first sample which had deep purples, oranges and dark blues. My current project is a pink version. The middle block is the Marigold. It only lacked a bit of applique to be finished, but it languished while other projects demanded my attention. Here you can also see the setting fabrics more clearly. It was good to see so many smiling faces at Bliss 1 tonight! I knew you could do it! Saturday started with a drive to Montrose, PA, where I was honored to be the guest speaker at a quilting day sponsored by A Stitch in Time Quilt Guild. 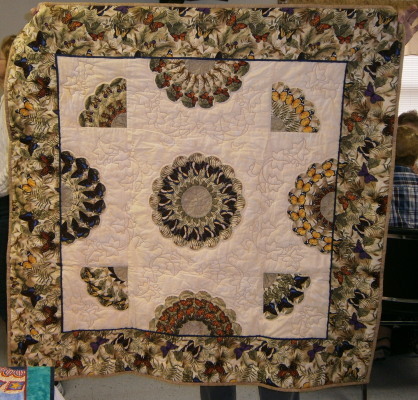 Almost 150 women met for a day of quilting, food, fun, and laughter. My friend Maria was head honcho for this event and what a great job she did! Sue S. from New York State had her finished Dresden Plate quilt completely done. 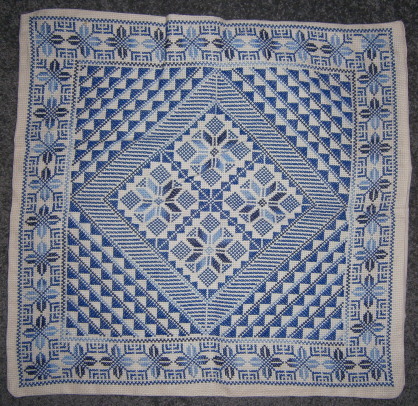 The border fabric was what she started with. 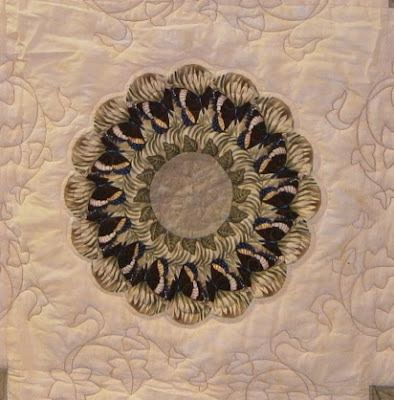 Here's a detail of the center plate and a bit of the quilting. Sue also had a finished Stained Glass Tulip quilt, but my camera was out of reach. 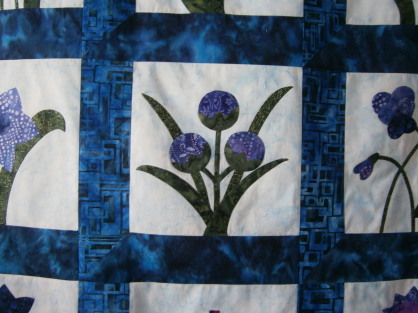 Trust me when I say it was beautiful--and hand quilted, too! After all the festivities, Maria, Kathryn, Evelyn and Bonnie took me to Endless Mountains Quiltworks in Tunkhannock, PA (www.EMQuiltworks.com). The shop is one of AP&Q's Top Quilt Shops and is absolutely delightful. The owner, Jeannette Kitlan, couldn't have been nicer or more welcoming. I found some treasures which I will share in another post. 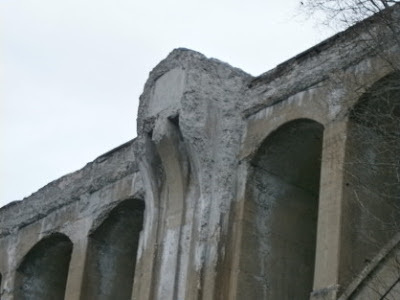 On my way home I came across two viaducts. Here are pics of one (the smaller). 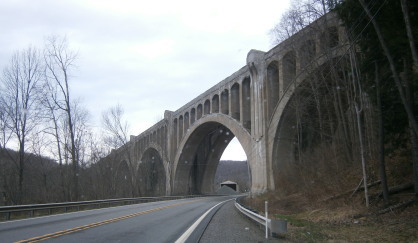 This is on route 11 in PA and is just a structural wonder! It is wide enough to accommodate two trains running on parallel tracks. 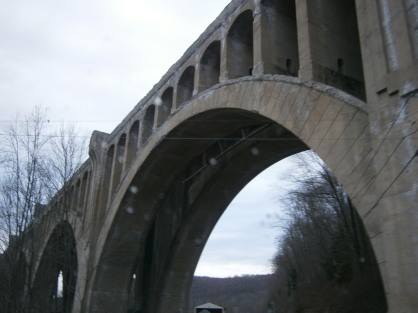 To find out more about the Tunkhannock Viaduct you can visit http://en.wikipedia.org/wiki/Tunkhannock_Viaduct. That viaduct is 2, 375 feet long and was finished in 1915! There is lots more information on the website and some amazing pictures of it being built and a photo taken from a plane. Impressive. Unexpected sightings of such structures are truly a blessing, in my estimation! So there you have the news from yesterday! It was a wonderful day from beginning to end. Many thanks to all the ladies who made it such a success! Last night, while driving home, I was so surprised to see so many people dining outside! With weather in the 70s it made perfect sense--until you looked at the calendar! Tonight I spent a fair amount of time dodging frogs in the road! It just doesn't seem possible. Spent some time outside today trimming off the butterfly bushes and the hops vines. I have bleeding hearts out of the ground and my Joseph's Coat rose bush is coming up from the root (it did nothing last year and I figured it was dead). Nothing very exciting to report. I was actually reduced to running my beloved Dyson today. With the windows wide open and a wonderful breeze to freshen the house. P.S. I am reading Spider Web by Earlene Fowler and listening to V is for Vengeance by Sue Grafton. P.P.S. Laurie, remember you said you'd have the new leaders on the next time I saw you! What an absolutely beautiful day. I had to keep looking at the calendar to be sure it really was only March 13. 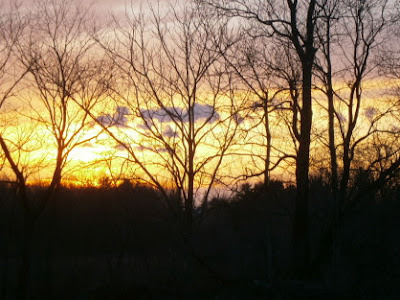 I saw my first bluebird today, and another flock of robins. 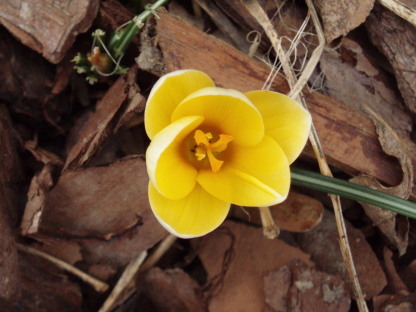 Spent some time cleaning out birdhouses and checking out the bulbs pushing leaves out of the ground. 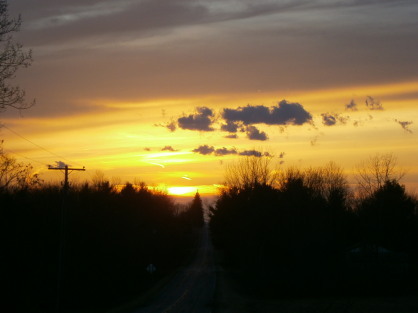 Here are some shots of the sunset. And a test...what do you see? 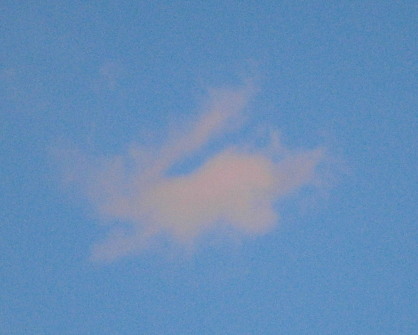 I think it's a fluffy pink bunny! I rarely "see" things in cloud formations, but this one was too good to pass up! Perhaps it's an omen for a rabbit-filled summer! And, no surprise, Rose did not look at the blog, so her little something was a surprise to her. And she loved it. I've made binding for 5 wallhangings and runners today. With just one block left to finish on my purple Green Thumb applique, I will be pushing the pedal to the metal in an attempt to get that finished this week. The pink version? Well, that needs a bit more work. I'm off to dreamland for a bit. More soon. You may remember the Believe wallhanging I made this same friend last year. 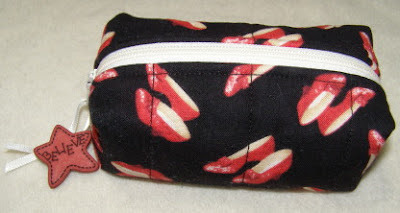 I used the same fabrics to make this! Check out the button--it was in my stash! And the inside. Too cute for words. 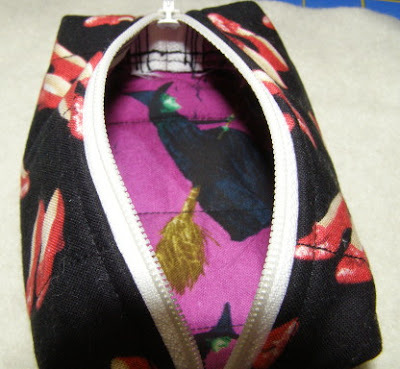 I (gasp) machine quilted it and even used fusible fleece! The zipper was almost too easy! Terry's patterns are wonderful and have clear, precise directions. If you've never used any of her patterns, be sure to check them out. Thanks, Terry, for the great pattern. You are an unbelievable designer. P.S. Ginny, it was great fun to be with you at the movies tonight! and was helped back up! My brother brought down his pickup and a "come-along" and ropes and we pulled the tree back up and staked it. 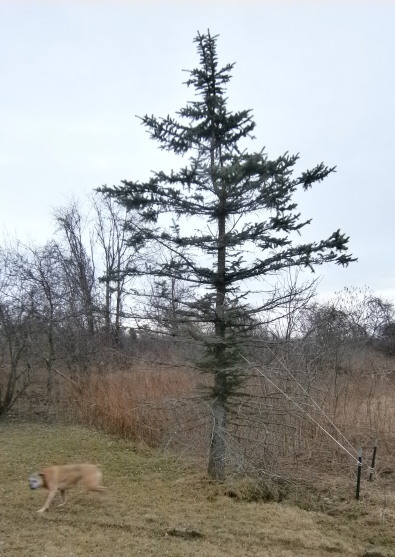 It was quite a process as we didn't have anything to pull against to raise the tree. No, we didn't just pull it up into position with the truck! The "come-along" was hooked to the bumper and then to the rope around the tree and then, by hand, was "cranked" about half way up. Then a second rope was attached and secured to a stake. The first rope was adjusted and cranked again. The rope already attached to a stake was readjusted to take the weight of the tree and the first rope was attached to a second stake. Quite a process. 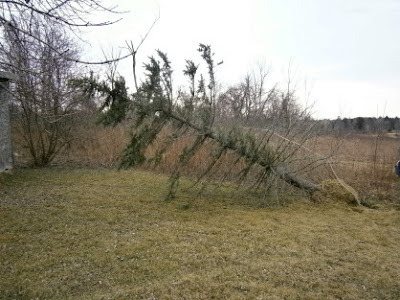 Please keep your fingers crossed that it stays upright and puts down more roots. 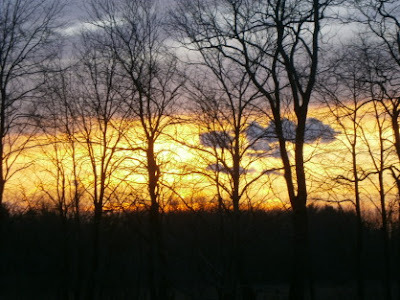 And, yes, this is the tree you frequently see in pictures as it is directly across from my sewing room windows. To add insult to injury, we got the truck stuck. (Did I mention the wet water springs in that area?) So we had to go get chains from my brother's house, come back, and attach the "huge" chains to the green ash tree further east of the newly uprighted tree. 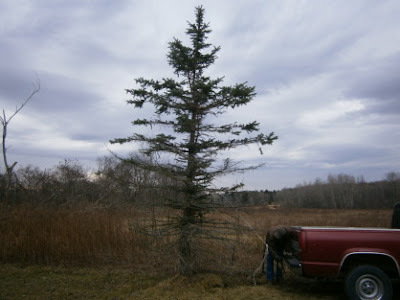 Can we just say that getting the truck "unstuck" was harder and took longer than getting the tree upright? We used the same "come-along" to drag along the truck as we had for the tree. The truck put up a much stronger fight! But we got it out with minimal ruts, no cursing and we were still laughing at the end. So how was your day? So there you have it for this 8th day of March. Did you know it is the full moon tonight? P.S. I have listened to Zero Day by David Baldacci, Robert B. Parker's Killing the Blues by Michael Brandman, Magic Hour by Kristin Hannah. P.P.S. Tomorrow a small reveal. It's actually a gift on its way to a friend's house, but she rarely reads the blog, so I think it's safe to post it. I've been busy!